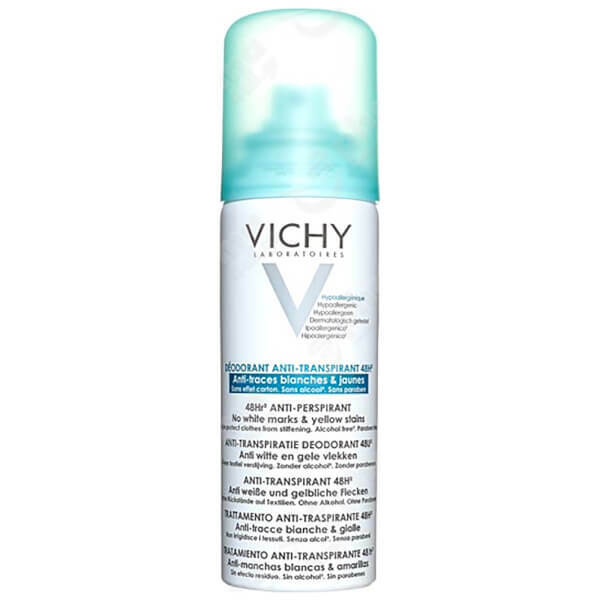 Vichy Deodorant 48Hour Aerosol 'No Marks' Anti-Perspirant gives an immediate fresh sensation with up to 48-hour anti-perspiration efficacy. Its 'no trace' technology leaves no white marks or yellow stains, and helps to prevent clothes from stiffening under the arm. 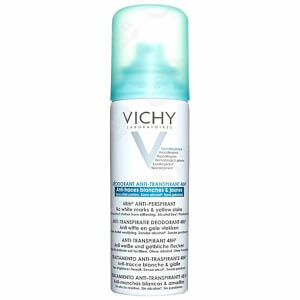 Housed in a convenient spray bottle for quick and easy application on the go. Spray from a distance of 15cm on to underarms. 882575 01, Isobutane, Aqua / Water, Dimethicone, Aluminum Chlorohydrate, Phenoxyethanol, Lauryl PEG-9 Polydimethylsiloxyethyl Dimethicone, Tetrasodium Glutamate Diacetate, Dimethiconol, Parfum / Fragrance, Code F.I.L. : B160020/4.